The first word that comes to mind when visiting Elpida Hadzi-Vasileva’s installation is simply ‘wow’. Visually spectacular yet deeply unnerving, “Fragility” is a magnificent example of recycling i.e. taking a material usually considered waste and re-using it. 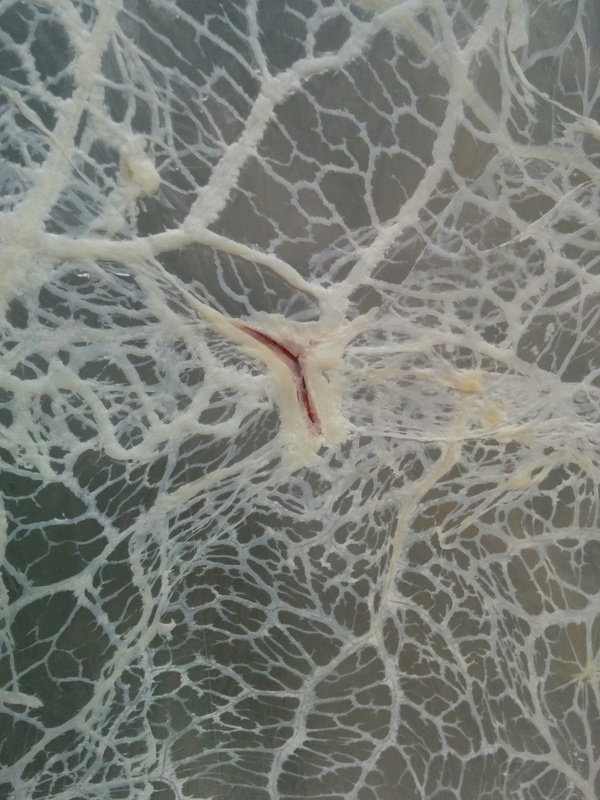 Vasileva uses an organic membrane used to hold vital organs together in animals, cleaning and treating it before laying it carefully onto plastic sheeting. These create translucent forms that play with light. The effect is striking, with many different elements to explore. The simplicity of the structures is the most impressive element of the piece and gives it gravitas. Rather than over-complicating or focusing too much on the “animal” element, it dramatically transforms the material from organic to another artistic material. It creates a suspension of disbelief and allows you to find solace in the chapel that’s created and marvel at the architectural beauty. The amazing roof and the little knaves around the outside of where the altar would be reveal a knowledge and admiration of churches found in the artist. As the time went on, I became aware of unsettling details. In places blood has pooled during the treating, there is a distinct red line in the midst of the beautiful white vessels and reminding me of the organic origins of this ghostly material. The great thing about this piece is its ability to conjure a complete and utter subjective experience for each viewer. Being unreligious myself, I found the overall structure of the piece, the “church” element, was not as provocative as the materials used. I found the visuality of the piece awe-inspiring but not necessarily emotional, preferring instead to admire the scientific and clinical process. Others, however, would look at the piece and get a very different response according to your own feelings upon the church-like structure of the piece – the unifying factor being the undeniable presence and awareness of death present within you when viewing the piece. I loved this exhibition and would urge anybody to visit Fabrica, it’s a special place. Particularly right now. Please see below for the interview with Elpida Hadzi-Vasileva. Be warned, IT WILL affect your initial experience. If I were you I wouldn't watch it until after you've seen it for yourself!